We know excursions can expand children’s concepts of the world around them and their role in society, so why are so many services still reluctant to take a step outside their doors? For many services in low socioeconomic areas, excursions are simply unaffordable for many families. Some services find the risk-assessments cumbersome, while others have a blanket ban on excursions. Gerard Moon, Auburn Council’s Children’s Services Co-ordinator believes the risk assessment process in particular can be off-putting for services. ‘Even the word “risk” makes people think there is a greater risk than there is and this is misleading. If it were called ‘future planning’ or ‘excursion plans’, it wouldn’t scare as many people off. Earlier this year, Mr Moon took groups of children over four days to the Royal Sydney Easter Show. He says it was ‘the easiest excursion’ he has ever done. Rattler was fortunate to accompany Mr Moon and a group of children on one of these outings. The children travelled via train to Homebush. First stop was the animal nursery where they patted and fed the animals. This was followed by a quick walk-through of the cattle pavilions before morning tea in the member’s stand, where they watched some ring events. After a quick toilet stop, the children toured the district exhibits (fruit and vegetables) before hopping back on the train and making it back to the centre by lunchtime. Next, Mr Moon hopes to plan a trip to the Sydney Aquarium—but first he will need to find two adults (parents or staff) with bronze medallions, because the aquarium is located at Darling Harbour. Water is a contentious issue for excursions in coastal communities, says Leo Prendergast, Director of Ballina’s Rainbow Children’s Centre. ‘In our area a child who was cared for in family day care drowned while on an excursion at Tweed Heads. ‘The Department is unwilling to define ‘near water’ but Ballina is [like] an island. No matter where you go, there is water nearby, whether it is a lake or stream, creek or river.’ Within his region, there is certainly the feeling among directors that excursions are ‘all too hard’. Plus Ballina has very little public transport and hiring a bus is expensive. Despite this, Mr Prendergast is a believer in the many benefits of excursions, particularly in building a breadth of experience for children. He believes there are too many children, particularly those in full-time care, who miss out on those ‘everyday experiences’ they would normally do with mum and dad such as posting a letter or buying a bottle of milk. ‘Potentially, children will spend three to four years in the same two rooms and have the same playground and same faces around them day in and day out. He says more than 36 per cent of the children at Rainbow Children’s Centre come from single-parent families. And very often there is not a lot of extended family about. So children and educators at Rainbow Children’s Centre regularly walk to the nearby shopping arcade of ten shops where they have seen bakers bake bread, taken trikes to be repaired at the bike shop and bought noodles or vegetables and taken them back to the centre for the cook to make for lunch. At the Point Preschool in Sydney, Director Catherine Lee says her vision is for children to build a strong sense of themselves within the community and to make meaningful connections with the world outside the gate. Children and educators step out the gate as often as they can where, as Ms Lee says, there is so much to ‘explore, see, discover and experience’. Other times, the children go much further. They may catch a train, a bus or car pool with families or meet at the destination, Ms Lee says. Children can make the decisions of where to go, what to do, who to invite and how to get there, she says. ‘When we decided to meet the people in the nursing home nearby, I explained they could not come to visit us as they were old and sick. One child said we should “take the preschool to them” so that’s what we did. Ms Lee says they deliberately do not have incursions (visiting entertainment) at The Point Preschool, although they do have visitors. ‘At preschool we don’t have an act of entering or raid or an invasion or conquest. We have family, friends and visitors who are invited, usually upon the children’s suggestion. We don’t have a sudden short attack. We have family, friends and visitors who share their time with us so we can get to know them and develop a meaningful relationship. We don’t have an infiltration or an onslaught, we don’t have an event that incurs liability. We don’t have words connected to war. We have words connected to people. ‘An incursion is, in fact, a hostile entering of territory… and I don’t think that ‘watching hatching ducklings’ is all that hostile,’ she jokes. While she believes on-site experiences have their place, she also thinks excursions provide children with emergent learning opportunities and are a form of ‘social advocacy’. 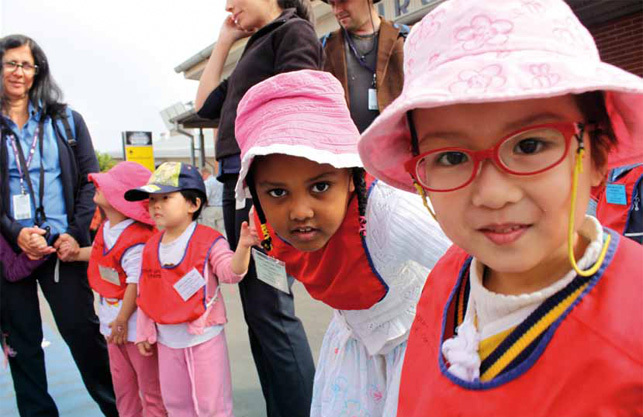 ‘Excursions give the children an opportunity to respond to diversity — in the people they see, as well as the environments in which they are immersed. Ms O’Neil says the bigger-scale excursions (zoo or aquarium) can quickly become an exercise in ‘herding children’, so she encourages regular small group outings and walking excursions that are interest-based. Ms O’Neil told Rattler of a recent interest that highlighted the children as civic participants in our community. ‘We had a traffic issue at the centre, and had written to local government about it. When this was ignored, we involved the children in renewed pleas to government. ‘The issue went to Council and the children went along to the chambers to see how it was being managed and even spoke to the councillors. They learnt a lot about government and we didn’t ‘dumb down’ the learning—we had high expectations of them to grasp the concepts. Traffic planners later visited the centre to talk to the children about road safety. As the EYLF states, children are ‘connected to and contribute to their world’. Ms O’Neil believes children gain a strong sense of identity by working out where they fit in the community.